We’d love your help. Let us know what’s wrong with this preview of Zinnia and the Bees by Danielle Davis. A colony of honeybees mistakes seventh-grader Zinnia’s hair for a hive ― and that’s the least of her problems. While Zinnia's classmates are celebrating the last day of seventh grade, she's in the vice principal's office, serving detention. Her offense? Harmlessly yarn-bombing a statue of the school mascot. When Zinnia rushes home to commiserate with her older brother and A colony of honeybees mistakes seventh-grader Zinnia’s hair for a hive ― and that’s the least of her problems. To ask other readers questions about Zinnia and the Bees, please sign up. It begins with twelve year old Zinnia yarn bombing Ronny, her middle school’s rattlesnake mascot, with her older brother the day before summer vacation. After spending the day in detention because someone outed her as a knitter (we never find out who did this), Zinnia thinks her day can’t get any worse. Before the day is over, 4,000 bees have taken up residence in her hair and she discovers her brother is missing. Adam told me once that he was named Adam and I was named Zinnia because our dad wanted his kids to experience everything in the world from A to Z. That’s how I used to feel with Adam, like we had all the letters of the alphabet connecting us. But now he’s left me here, a dangling Z.
Zinnia’s relationship with her mother can be summed up with the knowledge that she calls her mother Dr. Flossdrop. Without Adam as her anchor Zinnia is lost, feeling betrayed and confused by his absence. She’s also still feeling betrayed by some former friends. Zinnia’s new bird watching friend, Birch, and her Aunt Mildred bring a spark to what could have become an overwhelmingly sad book. I found it poetic that the bees find Zinnia since she shares her name with a flower but the bees didn’t give me the buzz (sorry!) I was looking for. I love bees so was initially intrigued to read from their perspective but each time I read one of the chapters dedicated to their story I became sad or annoyed. I couldn’t believe that such an intelligent species would be unable to locate a suitable home for themselves or that they could even survive for as long as they did without food (and assumably water). Then there was the fact that of all of the kids and adults in the book only one child detects any of the 4,000 bees on Zinnia’s head. Surely the buzzing alone of that many bees would be a hint! I am almost positive I would have enjoyed this book more if the bees never made an appearance. This is a story of bees, a dog named Milkshake, ice cream and French movies. Zinnia’s story is an exploration of how fear can prevent us from truly connecting with people and how lonely life can be when you don’t trust other people or yourself. I absolutely loved Laura K. Horton’s cover illustration. I’m still furious with Adam. With their mother emotionally absent when she’s not working or doing one of her community projects, Adam and Zinnia are all each other have. Adam’s excuse for why he didn’t tell Zinnia he was leaving felt flimsy and while Zinnia was quick to forgive him, I’m not. Surely he could have (view spoiler)[gone off and been a reality TV star on his own and still have clued Zinnia in so she didn’t spend most of the book wasting her time and emotional energy searching for him (hide spoiler)]. I kept wondering why Zinnia’s clothes were always charcoal grey when she uses all the colours of the rainbow when knitting. She mentions it’s her favourite colour but I thought there’d be more to it than that. Zinnia also counts random things throughout the book, usually when she’s anxious about something, so my mind automatically went to OCD. This is never addressed though. Disclaimer: I was provided a free ARC of this book. I could not stop cracking up. It's been a slog for me lately finding Middle-Grade that's both appropriate in scope, and not too thin or trivial with plot. There's a really careful balance to strike between language, humor, and emotional depth, and ZINNIA hit all the right notes for me. The bees are on a quest—they're tired of being captives, taken by truck from one place to another, never having a true home. Zinnia is also on a quest—to find her b Disclaimer: I was provided a free ARC of this book. The bees are on a quest—they're tired of being captives, taken by truck from one place to another, never having a true home. Zinnia is also on a quest—to find her brother, who's her best friend and only reminder of her father. Everyone in this book is a little lost, looking for something, and not quite sure how to get there. But the bees find a temporary home... in Zinnia's big, wild, curly hair. Which, naturally, presents some problems. And is also totally hilarious, as Zinnia desperately tries to get rid of them, to cover them, and above all, keep them secret. Because who wants to be caught with a whole hive of bees living on their head? Zinnia is a wonderfully-developed middle-grade character, and young readers will see themselves in her at once. But equally compelling is her new friend, Birch, who is like "the ocean"—a good listener who can take anything Zinnia throws at him, without flinching. The side characters in Davis's debut are so rich and entertaining that you can't help but get pulled along into their antics. Her mother, Dr. Flossdrop; her aunt who uses rose flavor in everything; her athletic neighbor who desperately wants Zinnia to call him "Coach"; and even the funny, peppy bees themselves. Davis plays a masterful balancing act between Zinnia's struggle to find how to solve her bee problem, and also how to bring back the brother she so sorely misses. ZINNIA AND THE BEES is the book of ten year old me's heart. ZINNIA is having a rough time. Her older brother has disappeared, her mom’s obsessed with “usefulness,” her friends aren't talking to her, and her yarn bombs keep getting her in trouble. Oh, and a lost colony of bees is using her big, unruly head of hair as a hive. That's right, hundreds of bees are living on her head. From the first moment I heard of this book, I knew I would love it. I mean, I have an entire wall in my house devoted to ZINNIA AND THE BEES is the book of ten year old me's heart. From the first moment I heard of this book, I knew I would love it. I mean, I have an entire wall in my house devoted to yarn, doing non-useful things fills me with guilt, and I spent my preteen and teen years with hair so big and unruly that I was known as The Girl With The Hair. Even the fact that Zinnia had a secret colony of bees living in her hair hits me in the feels; as a young teen, I refused to get my hair cut for at least a year, because there was this great big unmanageable mat/tangle the size of a fist buried deep in my hair, and I didn't want anyone to find it--kind of like Zinnia’s bees. And as an added bonus, ZINNIA has Birch--my newest favouritest sidekick character in the ever. Birch is uncoordinated, full of bird facts, eager to be Zinnia’s friend (much to her chagrin), and beautifully loyal. I wish I had a Birch to follow me around and tell me random things, because I adore him. I am reading an early manuscript of this novel. Can I just say how much I love this book? I LOVE this book! Maybe it is the knitting. Maybe it is the deftly handled issues Zinnia is confronted with, nothing earth shattering but ultimately real. Perhaps it is the unfolding of a lovely friendship. Or perhaps it is the bees and their small collective reflection on what it is like to get stranded on a girls head, contemplating their collective existence. 50 pages to go. I can't wait to see how everyo I am reading an early manuscript of this novel. Adam told me once I was named Zinnia and he was named Adam because our dad wanted his kids to experience everything in the world from A to Z. That’s how I used to feel with Adam, like we had all the letters of the alphabet connecting us. I’ll turn thirteen next year. Will Adam even be here? ZINNIA AND THE BEES is about a girl named Zinnia who is stormed by a colony of bees, who confuse her curly hair for their hive, and in trying to remove or shake them, a local birdwatcher, Birch, discovers the confused hive and questions their appearance, all the while, the world around them doesn't notice. Soon, Zinnia discovers the appearance of the bees cannot be shaken, and although having one’s hair busied with bees must be stressful or painful, and they must knot your hair into tangles, if one is lucky enough to not be allergic, they’re not bothersome because this is Magical Realism. The bees turn Zinnia’s hair into a “beehive”-hairstyle and they basically…sit. The aspect of t wasn't tackled realistically, and it bothered me entirely. Although, it obviously involved great, in-depth research, which I adored, but I MEAN, how would she not hear them buzzing or feel them crawling? Couldn't she get her mother to call the city's beekeeper or just take a stroll to the ER? Personally, it's so gross and weird to me because I hate bugs, although this type of occurrence does exist in real-life. I've read news-articles about bees gravitating onto hoods of cars, just out of blatant confusion, so yeah. Bees are still a no-no, but we still need them for our environment. It also bothered me when Adam went "missing." It's not exactly taken seriously throughout the entirety of the novel, by anyone other than Zinnia, (view spoiler)[ and it's eventually discovered he's chillin' (aka: trying to become a future MTV reality-show star). (hide spoiler)] Why wasn't anyone else concerned? Was this planned in advance? Questions, all the questions. Love this middle-grade book. Very positive, lgbtq+ friendly... <3 great little read! A delightful debut middle grade novel. The friendship between Zinnia and Birch (BZ) was especially well suited to the plot and the ingenious solution to Zin's bee problem was thoughtfully executed. I hope we'll see more of this charming character in the future. This book is absolutely genius and I love everything about it! Really.. Zinnia is a funny, sweet girl who knits (yard bombs) to de-stress.. She has a distant relationship with her mother, her father died when she was a baby, she thinks her friends deserted her, her BFF older brother has disappeared... and if that's not enough a swarm of bees have taken up residence in her hair. Yikes! Luckily she meets a new friend, Birch, and they navigate their summer woes together. Birch, by the All the stars! This book is absolutely genius and I love everything about it! Really.. Zinnia is a funny, sweet girl who knits (yard bombs) to de-stress.. She has a distant relationship with her mother, her father died when she was a baby, she thinks her friends deserted her, her BFF older brother has disappeared... and if that's not enough a swarm of bees have taken up residence in her hair. Yikes! Luckily she meets a new friend, Birch, and they navigate their summer woes together. Birch, by the way is now one of my all time favorite characters. He's sweet, quirky, and oh so lovable. We all need a friend like Birch in our lives. And the BEES! The bees are hilarious as they discuss revolting and the shared unhappiness with their new accommodations. My favorite bee quote, "We shall stop being petty and make the most of it." That's a real life lesson straight from the beehive. I had the opportunity to read an ARC of this novel through my #BookRelays friends (and also a digital ARC through NetGalley) and I think that middle school readers will definitely be attracted to the unique plot line and the well-voiced characters. Zinnia has just finished seventh grade by getting herself in trouble for yarn-bombing the school mascot with her older brother, Adam. But when she gets home from school, he has left the family mysteriously, without so much as a note. Adam's abrupt dep I had the opportunity to read an ARC of this novel through my #BookRelays friends (and also a digital ARC through NetGalley) and I think that middle school readers will definitely be attracted to the unique plot line and the well-voiced characters. Zinnia has just finished seventh grade by getting herself in trouble for yarn-bombing the school mascot with her older brother, Adam. But when she gets home from school, he has left the family mysteriously, without so much as a note. Adam's abrupt departure from home doesn't help Zinnia's tense relationship with her mother, and to make matters worse, a colony of bees has taken up residence in her hair. The idea of a mass of bees living on my head certainly makes me cringe, but, while Zinnia doesn't like the situation at all, she is amazingly calm about it. The character development is awesome as Zinnia goes from being a depressed loner, to realizing that sometimes it's good to have friends to help out. The book also has messages about reaching for your dreams, being vulnerable or "letting your hair down", and the interdependence of nature. In the words of Zinnia's Aunt Mildred: "bravo, bonbon." This book is stunning and everything a modern reader could hope for. Its handmade sentiments and DIY sophistication are woven through a journey of family, friendship, and creativity. From bees breakdancing to binocular-clad friends in plaid, the aesthetic oozes movie potential and is a delight to imagine. It would make a fantastic read-aloud in the middle/upper grades and is a dream of a classroom conversation starter. The story inspects fam In the words of Zinnia's Aunt Mildred: "bravo, bonbon." This book is stunning and everything a modern reader could hope for. Its handmade sentiments and DIY sophistication are woven through a journey of family, friendship, and creativity. The story inspects family relationships, particularly mother-daughter and sibling relationships, in an entirely fresh and honest way. And perhaps the most intriguing theme I felt was: acceptance. Acceptance of the daily "bees" that might arise, the people who can disappear from your daily routines, and the surprising people who slip in to fill the void. Oh, and did I mention all of these cool, clever, strong female characters? One bee in particular rocked my world. "Everybody needs to feel at home. Even if it's not exactly, perfectly the kind of home you always thought you wanted." Oh, ZINNIA, I love you. You are proof that we weird loners can find our homes, too--even in the most unexpected of places and with the least likely of people. You are proof that in the midst of some of the zaniest changes of adolescence, there are people who will stick with you, reach out, and listen (even as others leave). You are proof that none of us, no matter how much we try "Everybody needs to feel at home. Even if it's not exactly, perfectly the kind of home you always thought you wanted." Oh, ZINNIA, I love you. You are proof that we weird loners can find our homes, too--even in the most unexpected of places and with the least likely of people. You are proof that in the midst of some of the zaniest changes of adolescence, there are people who will stick with you, reach out, and listen (even as others leave). You are proof that none of us, no matter how much we try to appear so, are alone. When Zinnia’s older brother and best friend, Adam, disappears without a proper goodbye, Zinnia is left feeling very alone. This changes slightly (although not in a good way) when a colony of bees decide that Zinnia’s hair makes for a good temporary home. Told in alternating perspectives, between Zinnia and the bees in her hair, this is a story about finding your home, and balancing the feelings of change. Although, I don't normally read books with animal (or in this case, insect) viewpoints, the When Zinnia’s older brother and best friend, Adam, disappears without a proper goodbye, Zinnia is left feeling very alone. This changes slightly (although not in a good way) when a colony of bees decide that Zinnia’s hair makes for a good temporary home. Told in alternating perspectives, between Zinnia and the bees in her hair, this is a story about finding your home, and balancing the feelings of change. Although, I don't normally read books with animal (or in this case, insect) viewpoints, the bee chapters were some of my favorites. Reading this book made me laugh, despair, find hope again and ultimately relate to the sibling aspect. I think anyone could find something in this book that makes them feel something. Having bees in your hair is an interesting concept for a book , that and the fact that the young Zinnia knitted, made me give this book a chance. But other than inspire her, the poor bees just suffered the whole time. I suppose their little dialogues were supposed to be funny but they were painfully sad. We could have had no bees and had a good, fine story of a friendship and family dynamics. My recommendation would be to skip the chapters with the bees. Then you will enjoy the book more. Thanks Having bees in your hair is an interesting concept for a book , that and the fact that the young Zinnia knitted, made me give this book a chance. Zinnia is struggling with some tough relationships and losses in her life, and is trying to navigate through it all. The cast is fun (the bees too!) and the characters each bring something unique to the story. Can't wait to see this out in the world! I received an advance copy in exchange for an honest review. Quirky & fun, Zinnia will endure to fans of middle grade coming-of-age stories. It's a must purchase for all middle grade collections because it will hit home for many. I received a digital ARC from NetGalley, all opinions are my own! I know a lot of 9-10 year olds that are going to love this book! It's unique and original - kids will love how the bees made a hive on Zinnia's head! Zinnia is a young girl whose mother is overbearing, her brother has disappeared under the pressure, and a colony of bees has made their new home in her hair! This middle grade novel has just the right amount of magical realism and teachable moments to make it a good read for not just the 9-12 year old age group, but for others as well. The bees, normally creatures that I wouldn't want to be near because I don't care for insects, became sympathetic characters here. The group was formally transport Zinnia is a young girl whose mother is overbearing, her brother has disappeared under the pressure, and a colony of bees has made their new home in her hair! This middle grade novel has just the right amount of magical realism and teachable moments to make it a good read for not just the 9-12 year old age group, but for others as well. The bees, normally creatures that I wouldn't want to be near because I don't care for insects, became sympathetic characters here. The group was formally transported from crop to orchard and so on as professional pollinators. Never having been in a wild hive or having had to fend for themselves, when a car accident sets them free they have to make the best of a bad situation. In a town with few trees, worker Bee 641 is the bee elected to find a new place to go and follow their collective dreams, taken from stories passed down from bee generation to bee generation. The bad part? That new home is Zinnia's hair, with a smear of mint chocolate chip ice cream to attract her new "friends". Zinnia also has her fair share of problems. Her mom doesn't seem to understand her or her knitting/yarn bombing tendencies, activities that she deems "non-useful". Her brother, whose interests also lie in the arts, has left after escalating arguments with their mother about his future. Add this to the loss of her closest group of friends and her summer is looking pretty dim. Reading Zinnia's story, her working through her problems and her summer days, including reluctantly making friends with her neighbor's nephew and walking her mom's new dog, was always interesting. Zinnia has a pleasant voice, even as she was navigating a difficult time. Her interest in knitting and yarn bombing made her very relatable to me and, I think, somewhat unique. I almost never see main characters that knit like she did; artistic skills like drawing and painting seem to be more popular. There were alternating chapters and the others not told from Zinnia's first person perspective were told from that of the bees. That was fascinating because, as I mentioned before, I'm not a fan of insects. Reading the activity I've seen going on in the real world from a more personable perspective made it a unique experience. They were friendly creatures, telling the story of going from crop to crop until the day they break free and have to figure out what to do with their new found freedom. Going off "family" stories and, eventually, Zinnia's kindness and knitting know-how, they find their place and worker Bee 641, originally mocked for her lack of hive finding abilities, redeems herself and is revealed as the voice of the bees from the beginning. Zinnia learns a lot about grieving, about distancing herself from her friends while trying to cling too tightly to another important person, and about being true to yourself, even at the risk of losing everything. From the cover and from the description, one might not think that this novel has as much depth as I discovered it did, but rest assured that Danielle Davis did a masterful job of communicating important values while weaving a magical story. I received an advanced copy of this book from the author. Whenever I meet the author and hear them talk about their book, I always feel obligated to give them a good review. In this case, I didn't feel obligated to do anything; I truly enjoyed this book. When I first heard the concept, I thought it was hilarious! It's about a girl Zinnia, which is what I want to name my future child (seriously, in any fan fiction or book that I write, there is someone with the name of Zinnia in it.) who is a yarn I received an advanced copy of this book from the author. Whenever I meet the author and hear them talk about their book, I always feel obligated to give them a good review. In this case, I didn't feel obligated to do anything; I truly enjoyed this book. When I first heard the concept, I thought it was hilarious! It's about a girl Zinnia, which is what I want to name my future child (seriously, in any fan fiction or book that I write, there is someone with the name of Zinnia in it.) who is a yarn bomber (can anyone give a 'jealous?') and who somehow finds bees mistaking her hair for a hive. To be honest, though, I was a bit disappointed with her reaction to the bees. I think that we can all agree that if bees decided to take residence in any of our hair then we'd be smacking them away, freaking out, and screaming. But Zinnia calmly accepted the bees with limited freak-out. What I absolutely LOVED and thought was a true stroke of GENIUS was that the bees narrated sections of the book. The bees' point of view was my favorite part of the book. It was extremely interesting to see what the bees were thinking when they landed on Zinnia's head and how their whole system worked, while understanding that bees are similar to humans in the sense that all they want is freedom. I also thought that the bees behavior was hilarious and the way they messed with Zinnia had me laughing, even if it was inadvertently funny. Birch was another ray of sunshine in this novel. He is a bird-enthusiast and just the sweetest little thing. I can't help but love Zinnia and Birch's friendship, since she's kind of bitter (with good reason), while he's overly-eager and clever. He's also the only one who knows about the bees in her hair. Quirky and oh so original, Zinnia will be sure to charm middle grade readers! Thanks to the author for providing the @kidlitexchange network with a copy of this book for review purposes - all opinions are my own. ZINNIA AND THE BEES is definitely a different middle grade story, and one that will appeal to kids who love nature, knitting and cheering for the underdog in a story. Zinnia is dealing with issues that so many kids are dealing with - a working single parent, an absent father, a siblin Quirky and oh so original, Zinnia will be sure to charm middle grade readers! 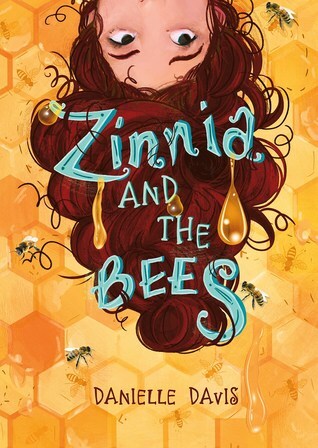 ZINNIA AND THE BEES is definitely a different middle grade story, and one that will appeal to kids who love nature, knitting and cheering for the underdog in a story. Zinnia is dealing with issues that so many kids are dealing with - a working single parent, an absent father, a sibling growing up and away from the rest of the family, friendship issues..........oh, and one issue that NO other kids are dealing with! A hive of bees on. her. head. The chapters in the story are mostly narrated by Zinnia, but some are narrated (in italics) by the bees and include a ton of factual information about bees and their hives - I told you it was unique! While Zinnia is a 7th grader in the story, it is a very very innocent story and will definitely appeal to upper elementary students with higher level vocabularies as well. Zinnia adores her big brother, but when Adam leaves home, she's devastated. She blames her mother, she avoids her former friends, she hates the new dog, and ... in a turn of events that requires some major suspension of disbelief ... her hair becomes the hive-of-choice for a displaced swarm of bees. Yarn-bombing and NMLZ. Dentists and activists. Coach and Birch. Bird-watching and Bee 641. Poor Zinnia is angry and isolating herself from her proverbial colony. She's finding the worst in every situ Zinnia adores her big brother, but when Adam leaves home, she's devastated. She blames her mother, she avoids her former friends, she hates the new dog, and ... in a turn of events that requires some major suspension of disbelief ... her hair becomes the hive-of-choice for a displaced swarm of bees. Zinnia and the Bees is such a fun and quirky read! It's a very cool, outside-the-box idea that will surprise readers at every turn. And it's funny! I loved all of the asides from the bees. It's got great heart too. I love a book that can balance jokes with heart and a great emotional journey. Keep this one in mind for all of the kids who are begging you for something different. I think they'll love it! Beautifully original; had a Roald Dahl vibe. I’m so thrilled it’s had so many great reviews. As a side note, I find it hilarious that there are a few people who didn’t connect with the book because it “wasn’t realistic.” Um ... it’s a book about a girl who has a literal beehive (?!) Sheesh. Imagination, people! It’s a gorgeous thing. Somehow, she makes it all work! This is one of the most unique plot lines I've read. A very good read-aloud for elementary aged kids, and I think older MG readers will appreciate it, too. QUIIIIIRKY. And cute. Definitely requires suspension of disbelief re: the bees, but everything about Zinnia's friend and family situations rings true. This highly original and magical book is terrific. Zinnia has a missing brother, a difficult mother (the amazingly named Dr. Flossdrop! ), challenging friends... And bees. In her hair. Readers will take to Danielle Davis' middle grade debut like bees to... you know. Highly recommend. Once in awhile a middle grade novel captures the essence of its audience. So it is with Zinnia and the Bees by Danielle Davis. Feeling abandoned and betrayed by beloved siblings leaving the nest; ignored, misunderstood, and unloved by parents mourning that same departure; and awkward among changing relationships with peers, middle grade kids cope in the best ways they know how. Prickly and difficult, for Zinnia (and so many others) that entails retreating inside her own head, a slouch, and a hoo Once in awhile a middle grade novel captures the essence of its audience. So it is with Zinnia and the Bees by Danielle Davis. Feeling abandoned and betrayed by beloved siblings leaving the nest; ignored, misunderstood, and unloved by parents mourning that same departure; and awkward among changing relationships with peers, middle grade kids cope in the best ways they know how. Prickly and difficult, for Zinnia (and so many others) that entails retreating inside her own head, a slouch, and a hoodie. Predictably, Zinnia is subjected to the encouragement of all of the well-meaning adults to remove her hood. “What are you wearing that hood for?” her mother asks. Coach Lou suggests the hood may be affecting her alignment. “I see you’re still wearing your disguise,” says Aunt Mildred. Which made me smile in recognition and question, why is it we adults are so triggered by a raised hood? Perhaps we should consider that there may be a perfectly rational reason for the omnipresent hood, like a head full of bees? I have to admit that bees are one of my irrational fears. Put me in a room with a bee, a wasp, anything with a stinger and a buzz, and the flying menace is the only thing I can concentrate on. It’s become a bit of a joke among those who know me well (or, frankly, those who know me at all but have been in the room with me during these unpleasant encounters). So I was both fascinated and horrified by the description of the cloud of bees following twelve-year-old Zinnia from an ice cream parlor. Aut I have to admit that bees are one of my irrational fears. Put me in a room with a bee, a wasp, anything with a stinger and a buzz, and the flying menace is the only thing I can concentrate on. It’s become a bit of a joke among those who know me well (or, frankly, those who know me at all but have been in the room with me during these unpleasant encounters). So I was both fascinated and horrified by the description of the cloud of bees following twelve-year-old Zinnia from an ice cream parlor. Author Danielle Davis essentially described my nightmare come true. But when the bees catch up with Zinnia, unlike in my nightmares, the bees don’t sting her. Instead, 4,000 bees take up residence in Zinnia’s hair (I’m not sure that’s much better than being stung). Zinnia needs to figure out how to get rid of the bees in her hair AND how to find her missing older brother. She feels completely lost and doesn’t know where to start. But then she meets Birch, who is visiting his uncle for the summer. Birch offers to help find a solution for the bees. Through her time with Birch, Zinnia learns about friendship and about herself. Thank you to Capstone Publishers for the ARC, provided via NetGalley, in exchange for an honest review. I enjoyed Zinnia and the Bees immensely. It was wonderful, super cute and so freaking adorable. I loved the concept of the Bees and how the story was also told from their POV. I also enjoyed the fact that there was emphasis placed on bee-saving awareness and that the importance of bees in nature was illustrated superbly. I loved the fact that Zinnia knits and that she yarn-bombs Thank you to Capstone Publishers for the ARC, provided via NetGalley, in exchange for an honest review. I loved the fact that Zinnia knits and that she yarn-bombs. As a knitter myself I really loved reading a book with a young character who has a love for crafts and who enjoys it. The fact that the Bees took to Zinnia’s hair was just utterly hilarious and very original. I loved how Zinnia’s love for knitting also helped the Bees in their quest to find a new home. Birch was such an amazing character. I loved his dorky attitude and his go-getter manner to make Zinnia his friend. I just wanted to squeeze him because of his cuteness. His info and quips about birds and nature in general was really endearing. I loved Zinnia’s refreshing personality. She had her own problems with being different and the insecurities regarding this. I especially enjoyed the fact that despite all this, she still attempted, in a very long way, to make things better. Her problems with her mother were prominent and I liked the fact that as the story progressed, the issues between mother and daughter started to clear up and that the possibility for a better relationship was implemented. The only issue I had with the book was that I wish there was a little more interaction between Zinnia and her brother, Adam. I felt that this could have been explored more, especially in the end of the book. But despite this, I freaking enjoyed this book. The cover and the pages are visually stimulating. The story flowed wonderfully and I sincerely think that Zinnia and the Bees was a refreshing and original story. I recommend this book to readers who love middle grade boos with original characters, an interesting situation, bees and bee-saving awareness. Old and younger readers alike will enjoy this book. Kindly check out my review on my blog, which is full of gifs and other details! Find out what all the delightful BUZZ is about! A heartwarming story of friendship, family, and homecoming, with a dash of yarn bombing and bees. 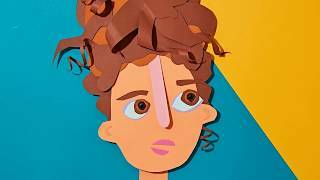 Zinnia is having a terrible summer: her best friends shun her, her mother ignores her, her brother abandons her family, and now bees have taken residence in her hair. Enter a new friend and a plan, and Zinnia discovers how to reconnect with the people she loves while saving herself and the lost bees. Danielle Davis reads and writes in Los Angeles.